Govind Nihalani’s 1998 film is a riveting take on the Naxalbari movement that shook Kolkata’s rich and poor alike. The death of a Doordarshan journalist and three policemen in a Maoist attack in Dantewada has brought back in focus a militant group that has long plagued India. These faceless militants often make it to our headlines be it through an attack in Chhattisgarh or by killing a politician in Andhra Pradesh. Indian cinema has from time and again tried to put a face on them and one of the finest examples of this is Govind Nihalani’s film Hazaar Chaurasi Ki Maa. The film depicts in detail the story of a boy from an elite bhadralok family in Kolkata who leaves behind his world to join the Naxal movement in the late 1960s and the consequences of that decision on his family. Hazaar Chaurasi Ki Maa is based on Mahasweta Devi’s novel by the same name. The film is centred on the journey of Sujata Chatterjee, played by Jaya Bachchan, who wants to understand the struggles of her deceased son, Brati Chatterjee (Joy Sengupta), who was supposedly killed due to his involvement with the extremist Left insurgency. The camera follows Sujata and her guilt of not knowing her national scholarship-winning son’s ideologies and intentions at a time when the city of Kolkata was gripped by the Naxal movement. The movie takes off on a sinister night when a phone call from the local police station to the Chatterjee household asks them to come and identify their son. Dibyanath Chatterjee, played by Anupam Kher, refuses to receive his son’s body and is scared his family name may crop up in connection to this incident. Scared to let his car be seen near the mortuary, they leave with their daughter-in-law to see the body. There, a stern police officer refuses to release the body marked 1084 (hazaar chaurasi in Hindi) or his belongings. Brati, along with four others, is cremated in silence. The next day, Dibyanath Chatterjee and his elder son are happy and relieved that their influential connections paid off and Brati’s name is kept from the papers. A week later, every symbol of Brati is consciously removed from the Chatterjee household for fear that his involvement with the Naxal movement can surface in their bourgeoisie circle. It is then that Sujata demands to know and understand her son’s struggles and starts tracing his last days. This journey takes her to a shanty in the city where Comrade Somu lived, who died along with Brati. Nihalani’s exceptional storytelling shows us the class divide in the urban Naxal movement. Somu’s mother wails loudly while Sujata keeps her pain pent up under society’s pressure. We are then shown Brati’s life as a Naxal— the hushed roundtable meetings, the phone calls and of course the ‘Naxalbari zindabaad’ sloganeering. Amidst these discoveries, Sujata laments not having known her son better. The son who loved his mother, but one who also hid his revolutionary side from her and was committed to liberating downtrodden farmers from brutish landlords. We are also introduced to Nandini (Nandita Das), Brati’s love interest, another Red revolutionary who survived police torture and lived to tell the tale to Sujata. Sujata now understands her son’s dream of an egalitarian society and launches her own struggle to find justice for Brati and his friends who were killed by a mob in Somu’s shanty. In the end, we see that Sujata become a part of a human rights organisation. Nandini, too, legally fights for justice against the inhuman torture meted out to her by the police for two years. Indian cinema has tried to bring the tale of Naxalites to the big screen many times and in multiple languages – Satyajit Ray’s Pratidwandi, Venu Nagavally’s Lal Salam, Sudhir Mishra’s Hazaaron Khwaishein Aisi, Prakash Jha’s Chakravyuhand— but Nihalani’s film is a brilliant example of how a steely CPI(M) coalition government dealt with the insurgency in Bengal. With no songs and only Debajyoti Mishra’s forlorn background score to emote, the director masterfully emulates Sujata’s sad confusion—something many urban Bengalis were facing at the time. 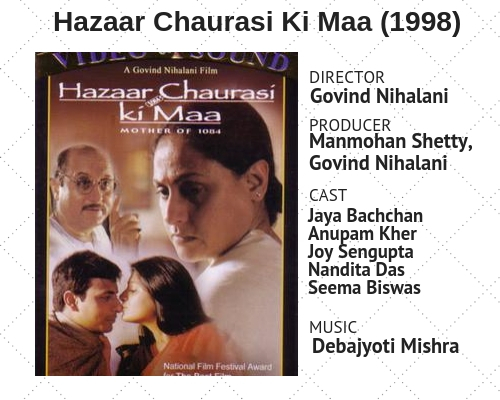 His restrained yet gripping storytelling has made Hazaar Chaurasi Ki Maa one his finest works in his filmography. During the 1990s, the fear of children leaving their schools and colleges to join the revolution gripped the poor and rich alike. At the end of the Naxal wave, the poor lived in disgrace forever while the rich actively worked to ignore and forget the children they lost. Hazaar Chaurasi Ki Maa was a tale told from the elite’s perspective and to this day rings true of the silent loss the Calcutta bourgeoisie suffered.